Defiance, faith and triumph in a heartrending novel about daughters and mothers. On a miserable November day in 1967, two women disappear from a working-class town on the Fraser River. The community is thrown into panic, with talk of drifters and murderous husbands. But no one can find a trace of Bette Parsons or Alice McFee. Even the egg seller, Doris Tenpenny, a mute woman to whom everyone tells their secrets, hears nothing. Ten-year-old Lulu Parsons discovers something, though: a milkstained note her mother, Bette, left for her father on the kitchen table. Wally, it says, I will not live in a tarpaper shack for the rest of my life . . .
Lulu tells no one, and months later she buries the note in the woods. At the age of ten, she starts running - and forgetting - lurching through her unravelled life, using the safety of solitude and detachment until, at fifty, she learns that she is not the only one who carries a secret. Hopeful, lyrical, comedic and intriguingly and lovingly told, The Very Marrow of Our Bones explores the isolated landscapes and thorny attachments bred by childhood loss and buried secrets. 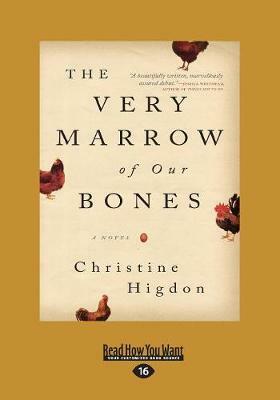 Buy The Very Marrow of Our Bones by Christine Higdon from Australia's Online Independent Bookstore, Boomerang Books.